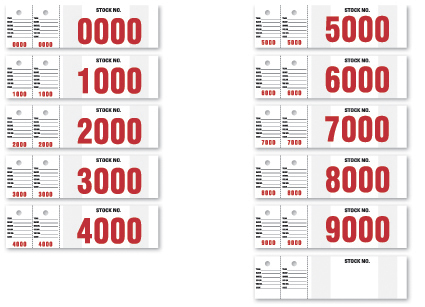 Series 0000-0999, these stock tags have large red numbers with 2 tear off key tags. Pressure sensitive tape on stock tag allows you to adhere tag to windshield. Actual size of vehicle stock number is 2” high & 7” wide. Key rings not included. Packaged 1000 per box.